Know thine enemy: The Panthers are seemingly going to be “The Panthers” for the rest of their existence. They’re made to suffer, plod along and finish near the bottom of the standings. It’s just their lot in life. Still, they’ve won three of four, so taking them seriously should probably be something the Jackets do. Despite all the additions offensively, rookie defenseman Aaron Ekblad leads the way with 13 points. Fellow young stud Nick Bjugstad leads the team with eight goals and they do have a half-dozen guys with at least 10 points. Unfortunately, it kind of ends there. They’re managing just 2.13 goals per game and are treading along at 10-7-6. The driving force has been goalie Roberto Luongo. He’s 8-5-5, but has a very nice 2.37 goals against average and .927 save percentage. Backup Al Montoya hasn’t been bad either, going 2-2-1 with a 2.00 goals against average and .923 save percentage. If the goaltending is on, the Panthers are in it. 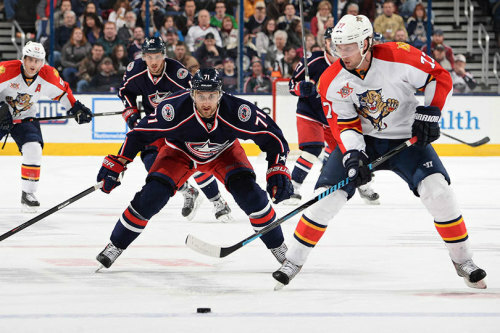 About the Blue Jackets: The Jackets are looking to make it two in a row, having defeated the Panthers back on Monday. The team received another blow on the injury front when it was announced that Mark Letestu would undergo surgery to fix groin and abdominal issues, putting him on the shelf for six weeks. At this point, it’s basically the Ryan Johansen and Nick Foligno show. Both are at a point-per-game pace and the only source of offense. The team needs to find more balance, but it’s hard when half the lineup is out. Defensively, things are looking better, but their bloated 3.46 goals against per game is due in large part to the goaltending. Starter Sergei Bobrovsky hasn’t been very good, going 6-8-1 with a 2.89 goals against and .910 save percentage. Backup Curtis McElhinney has basically been an automatic loss, going 1-6-1 with an ugly 3.46 goals against and .897 save percentage. If the Jackets are going to turn things around, it’s got to start in net. The last time these two played: It was a slow game offensively, but the Jackets got help from a pair of rookie callus. Michael Chaput and Kerby Rychel got the nod and Rychel would go on to assist on the game-winner by Boone Jenner. Both goalies were sharp, though they only faced in the mid-20s in shots. Overall, it was a quiet, uneventful game, so hopefully a little more will happen in this one. The part where I predict things: The Panthers are looking a lot better and the Jackets are still trying to come up for air. It seems that nothing can go right for them for more than a day or so before another setback hits. That kind of luck can have a serious effect on the mentality of a team and it’s showing with the Jackets. Look for Bobby Lou to clamp down in front of the home crowd and keep the Panthers on the winning track.